New Fairfield, CT: Groovin’ in New Fairfield is thrilled to welcome back PESKY J. NIXON with special guest LAURA SUMNER on Saturday, April 27 2019 at 7:30pm, at the New Fairfield Senior Center, 33 Route 37, New Fairfield, CT. Tickets are $10 and doors open at 6:45 pm. Advance Tickets can be purchased at the NF Sr. Center (203-312-5665) or by mail. Payments made by mail should be payable to Groovin’ in New Fairfield, and sent to GINF c/o New Fairfield Sr. Center 33 Rt.37 New Fairfield, CT 06812 Please allow sufficient time when mailing. All Sales Are Final. 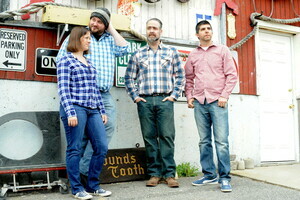 PESKY J NIXON: Bombastic yet brilliant, these boys from New England exude a genuine musical authenticity and mirth on stages up and down the East Coast. 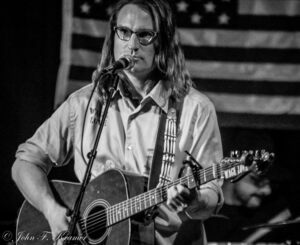 Drawing influences from contemporary urban balladeers, rowdy southern bluegrass, and the sardonic yet wry wit of New England’s localized folk scenes, Pesky J. Nixon (PJN) creates an atmosphere both inviting and challenging for audiences. LAURA SUMNER began her music career at the awkward age of 18 when she walked into a pub in Connecticut with guitar in hand and asked to perform. That on-the-spot audition (a rendition of the Allman Brothers’ Ramblin’ Man) led to an immediate offer for additional gigs. Intimate Russian venue serving infused vodkas, caviar & other fare to the tune of live music. 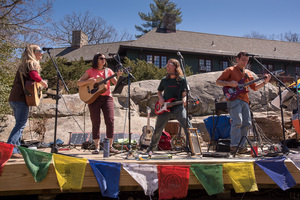 Saturday, May 4th, 2019 7 p.m.
Eco Folk Rock | creative solutions to climate challenges. Come see this preview show for our 2019 3-week "A River Runs Through Us" tour in Nepal! 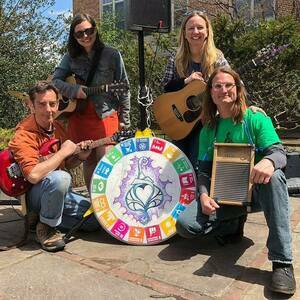 Eco Folk Rock | creative solutions to climate challenges. Thursday, May 16th, 2019 7:30 p.m. 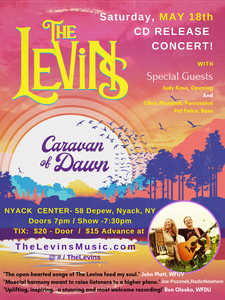 The Levins' Caravan of Dawn CD release party at the Nyack Center, with multi-media projection. 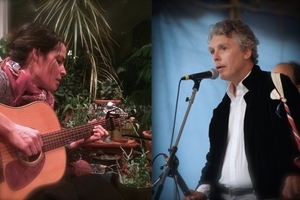 Ira and Julia will be joined by Pat Falco on bass and Chris Marshak on drums. By birth a Tennessean, David Massengill “emigrated” to the Greenwich Village folk scene in the mid-70’s, walking the same streets and playing the same storied coffee houses as Dylan and Van Ronk. Thirty years later, he’s still walking those streets—but now he’s being recognized universally for his pivotal role in keeping the American folk music tradition alive. Called “a master of vivid lyrical imagery” (Boston Globe), David continues to create beautiful and poignant “story songs” that are intimate and relevant and tug at your emotions. Songs like "Rider On An Orphan Train“ a narrative ballad ringing with truth and anguish” (Washington Post), "Number One In America", a riveting and ironic civil rights anthem” (Boston Globe) and the biting political statement, "The Gambler", a thing of beauty about all things ugly” (Barry Crimmins). David has released six albums, eleven bootlegs and fourteen books to date, including “Partners in Crime”, the debut album of The FolkBrothers, David’s duo project with the late great Jack Hardy. 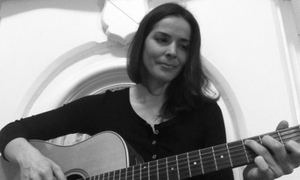 Jo Williamson, a fellow Jack Hardy's Songwriters Exchange participant, will share the stage with David. A former New York based singer, songwriter, actress and visual artist, Time Out NY had described her as having "an intriguing lived-in quality to her voice and a talent for smart elegant turns of phrase." Jo’s musical oeuvre is a journey of the heart. Her work is introspective and personal. She shares with us the depth and intensity of a compelling inner world. Her songs are intelligently crafted and exquisitely delivered with the support of her luscious voice. 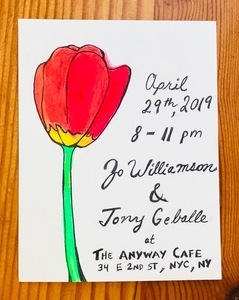 She is a graduate of New York University Tisch School of the Arts and has collaborated with artists including Brent Arnold, Martha Wainwright and avant-garde/classical composer Faye Ellen Silverman. In 2018 she released her fifth recording of music, 'Kidz Talk', a collection of original songs for kids of all ages. Jo currently lives in Westchester and is a valued new addition to the Tribes Hill community. Musicians are invited to register for the 5th Annual RiverArts Music Tour. Last year's tour included more than 250 musicians, performing 120 performances at 36 venues. Almost 3,000 people attended this free celebration of music in the Rivertowns. See Tribes Hill homepage for information. 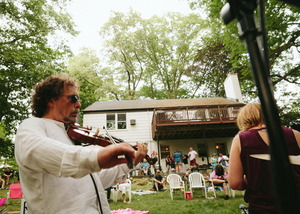 For over half a century, RiverArts has been the catalyst that connects performers, musicians and art-makers with Rivertowns audiences. Motivated by a belief in the power of art to bring insight and delight, RiverArts delivers programs that have repeatedly brought us together, welcomed newcomers, and created experiences that strengthen our sense of community. Become a member and enjoy a full-year of art, music and community! New board members, officers and volunteers needed. Talk to Rick Rock (914-564-9212) if interested. Music featured at the Free Music Fridays series thematically reflects the spirit of the self-taught art on view at the museum. Support the proceedings with a donation-based cash wine bar. Admission is always free. The American Folk Art Museum is an art museum in the Upper West Side of Manhattan, at 2, Lincoln Square, Columbus Avenue at 66th Street. Since 1961 the American Folk Art Museum has been shaping the understanding of art by the self-taught through its exhibitions, publications, and educational programs. As a center of scholarship and by showcasing the creativity of individuals whose singular talents have been refined through experience rather than formal artistic training, the museum considers the historical, social, and artistic context of American culture. Its collection includes more than seven thousand artworks dating from the eighteenth century to the present, from compelling portraits and dazzling quilts to powerful works by living self-taught artists in a variety of mediums.